Directions to cabin we're spot on. Very considerate to call and make sure we had arrived safely. Engagement Weekend!!!! Friday was spent at Mingus Mill where my best friend agreed to marry me. Our closest friends were here to capture the special moment. The rest of the weekend was spent watching football, hiking and all kinds of fun things What a wonderful place. We will be back. What a wonderful getaway weekend for my husband and I from a very hectic year. We are blessed to be able to come and enjoy this lovely cabin and view. We had so much fun can't wait to come back. This cabin was perfect for our trip. The beds were comfortable, amenities nice. We had everything that we needed for out cooking. Thank you again. When I had questions before the trip they responded quickly. All email communications. This place is just what I imagined it would be. Most beautiful! Beautiful cabin. We really enjoyed our stay. Thank you so much we look forward to coming back again soon. The views from the cabin were spectacular. 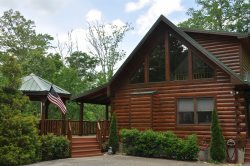 The cabin is spacious, well-furnished, and fully stocked. The national parks and national forests are close. Loved having a full kitchen and grill. Access to the cabin was easy, The directions were perfect. Nothing could have been done to make our stay more enjoyable from a cabin perspective. The views from the cabin were spectacular. The cabin is spacious, well furnished and fully stocked. The National parks and national forests are close. Loved having a full kitchen and grill. Access to the cabin was easy, the directions were perfect. Nothing could have been done to make our stay more enjoyable from a cabin perspective. This was our grown up fall break. We love this time of the year. We loved checking out the waterfalls. We absolutely loved the cabin. IT was perfect. It felt so homey. So quiet adn peaceful. Can't beat the location we will be back. Drove all over, Sylva, Franklin, HIghlands and Nantahala to look at waterfalls. The hikes were worth it. We had a wonderful time here at the cabin. This cabin had all the amenities of Home. Mountain Air is Great For sleep. Looking forward to our return. The cabin made us feel warm and cozy from the min we got here. We really enjoying relaxing in the hot tub. Enjoying the hot dogs and marshmallows on the fire pit. Thank you so much.